Your cars power steering pump is powered by a belt connected back to the crankshaft pulley. Spinning these two pulleys draws precious horsepower from your engine. NEUSPEEDs powertrain engineer, using sophisticated CAD software, performed a mass properties analysis to determine the ideal weight and diameter of the crank and power steering pulleys. 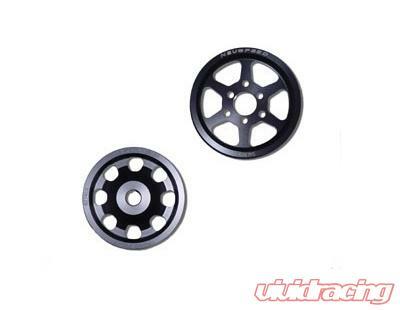 By manufacturing the NEUSPEED pulleys out of 6061-T6 aluminum to reduce weight, and resizing the diameters to slow the drive speed of the power steering pump, a 4 hp gain at the wheels is achieved. Made of 6061 T-6 billet aluminum, hard anodized in black. Original equipment serpentine belt may be re-used.